How to draft a 2018 Employee Attendance Calendar? 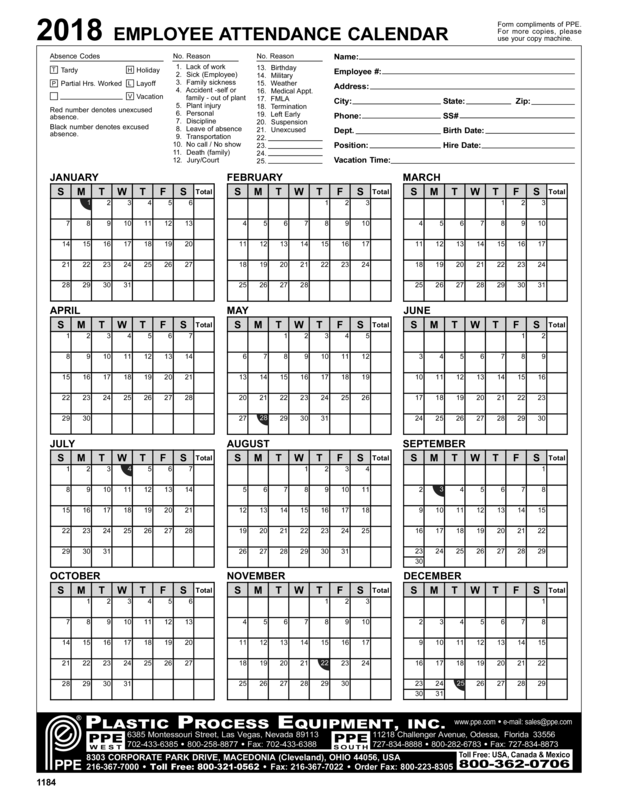 Download this 2018 Employee Attendance Calendar template now! We support you and your company by providing this 2018 Employee Attendance Calendar HR template, which will help you to make a perfect one! This will save you or your HR department time, cost and efforts and help you to reach the next level of success in your work and business! This 2018 Employee Attendance Calendar has ways to grab your reader’s attention. It is drafted by HR professionals, intelligently structured and easy-to-navigate through. Pay close attention to the most downloaded HR templates that fit your needs. Download this Human Resources 2018 Employee Attendance Calendar template now! Birth Date: Position: Hire Date: Vacation Time: FEBRUARY S M T W T F Total W T Total 13 4 5 6 7 8 9 10 4 5 6 7 8 9 10 14 15 16 17 18 19 20 11 12 13 14 15 16 17 11 12 13 14 15 16 17 21 22 23 24 25 26 27 18 19 20 21 22 23 24 18 19 20 21 22 23 24 28 29 30 31 25 26 27 28 25 26 27 28 29 30 31 F S Total 1 W 2 T 3 F 4 S Total 5 T W T F 1 S Total 2 8 9 10 11 12 13 14 6 7 8 9 10 11 12 3 4 5 6 7 8 9 15 16 17 18 19 20 21 13 14 15 16 17 18 19 10 11 12 13 14 15 16 22 23 24 25 26 27 28 20 21 22 23 24 25 26 17 18 19 20 21 22 23 29 30 27 28 29 30 31 24 25 26 27 28 29 30 W T F S W 1 T 2 F 3 S 4 T F S Total 10 11 12 13 14 5 6 7 8 9 10 11 2 3 4 5 6 7 8 15 16 17 18 19 20 21 12 13 14 15 16 17 18 9 10 11 12 13 14 15 22 23 24 25 26 27 28 19 20 21 22 23 24 25 16 17 18 19 20 21 22 29 30 31 26 27 28 29 30 31 23 30 24 25 26 27 28 29 3 4 5 S 7 SEPTEMBER S M T W 9 F 6 Total 8 T 5 AUGUST S M T 2 W 4 4 Total 1 OCTOBER S M T 3 7 T 2 T 6 3 1 JULY S M 5 2 S 12 JUNE S M 1 F 11 T 3 T 10 4 2 S 9 MAY S M 1 MARCH S M 8 W 6 Address: 7 3 5 Employee : 2 T 4 Name: Birthday Military Weather Medical Appt..